The Crow is a 1994 film starring Brandon Lee. The film was dark in nature and is often described as Gothic. Lee wore a leather outfit in the movie and whitish gray clown-like makeup. This makeup scheme is often used for Halloween and masquerade parties to this day. 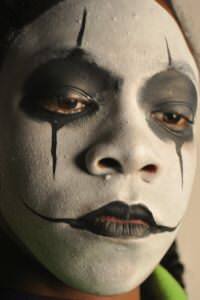 The following are tips on how to replicate The Crow makeup using face painting techniques. Face and body painting is a form of art, and can be considered a fashion statement in some circles. It's fun and not very difficult to recreate Brandon Lee's The Crow mask using face paints. One would need water-based theatrical makeup in both black and white. This makeup is also sometimes labeled as just "face paint." It is important to use this type of makeup because it's safe and easy to remove. Just because a paint is labeled "non-toxic" doesn’t make it safe for the skin. Avoid using products like tempra or acrylic paints. Face paint can usually be purchased at party supply stores, costume shops and some craft stores. It's also easily found online. In addition to the face paint, you're going to need makeup sponges, small brushes, a cup of water to clean your brushes, and baby wipes to clean up any mistakes. Be sure to have your work area covered with newspaper and have the person you are painting wear old clothes or a smock because the makeup can stain if it drips on anything. There are two different kinds of face paint that are commonly available, cakes and liquids. They require different methods to apply them. If you are using cakes of face paint, the face paint needs to be moistened to apply it smoothly. When you are using your sponge, you need to dip the tip of your sponge in the water. You just want to slightly moisten it, you don't want the sponge to be dripping. Then you rub the dampened sponge on top of the cake to pick up the makeup that you need. If you are using a brush, the same principle applies, just dip the tip of the brush into the water and run it along the top of the face paint cake. Begin painting The Crow by covering the face with white makeup. Applying the makeup with small circular strokes helps you to get even and consistent coverage. Be sure to get the areas on the side of the nose, they can be tricky. Having the person that you are painting look up is an easy way to get good coverage of the area under the eye. After completely covering the face with the white makeup, it's a good idea to let it dry thoroughly before starting with the black. A small round pointed brush is best used for the black details of the Crow. Carefully outline the lips by tracing the natural edges of the lips. After outlining, just fill them in. The eyes are a bit more tricky. Be especially careful when painting around the eyes. Begin by outlining them in black. Paint the lines that form the points going above and below the eyes. You want the vertical lines to be lined up with the center of the eye. After you have the lines, go back and paint more around the eyes, thicken the lines so that they are very thin triangles as shown in the picture. Let the paint dry, and enjoy your new face for that Halloween party or event. The Crow is about a young couple that were about to be married. The pair are violently murdered, and Lee returns from the grave to avenge the death of his fiancé. He kills each of the criminals that had invaded his home and killed him and his fiancé. A famous scene in the movie is when Lee goes to a pawn shop and pulls out a tray of wedding rings, with each ring representing a life that was ruined by a criminal that presumably stole and hocked it. Face painting tips provided by moogieland.com and modeled by Luis Scott.